About a month ago, I included a photo of a blurry near-full moon and a tree branch in fine focus. I mentioned that it was supposed to be the other way ‘round. Several people commented that they liked the photo the way it was. That left me wondering what to do if I ever got the photo I wanted. Well, that time has come and I figured that I can give myself more time to work on the post I’m struggling with at the moment, and give you and my editor a break from reading. Here’s the photo from last month. Yeah, the moon was supposed to be in focus and the tree was supposed to be blurry. The gallery below has the photos from this month, and a similar study of focus with moon and birds. You can let me know in a comment, or, if you want to get out before the next full moon, you can register your opinion in the poll below the gallery. If you want to know why these photos turn out the way they do, consider the following: I am using a point & shoot camera, zoomed in pretty far. I’m attached to an Irish Setter who is fascinated by every moving thing, every sound, every smell and every person, squirrel, bird and bunny that is or recently has been near our spot. Thanks for stopping by. I think the one on the left is a Starling. Not sure about the one on the right. This is the photo I was trying to get. This is closer to what I had in mind for that photo. It’s dark enough that I can’t tell if the trees are in focus. Yes, I was using auto-focus. Remember, one hand is tied to a dog. I was mainly interested in the birds on the wires. Hihih, your poll is a no-brainer! MADDIE!!! Also, I think the moon is too far for a point-and-shoot to get a proper auto-focus on it, no? Anyway, I support all such explorations and am always surprised how my Nikon chooses its auto-focusing preferences. As for the starling, couldn’t the other one be one as well? Ha, I knew it. I should have included a photo of the pup, but the animals have been stealing the show here lately. I didn’t see any images for brownish-gray starling. There’s a couple bird gurus that visit here, maybe one will set me straight. The moon is a bit of a stretch for a point and shoot. 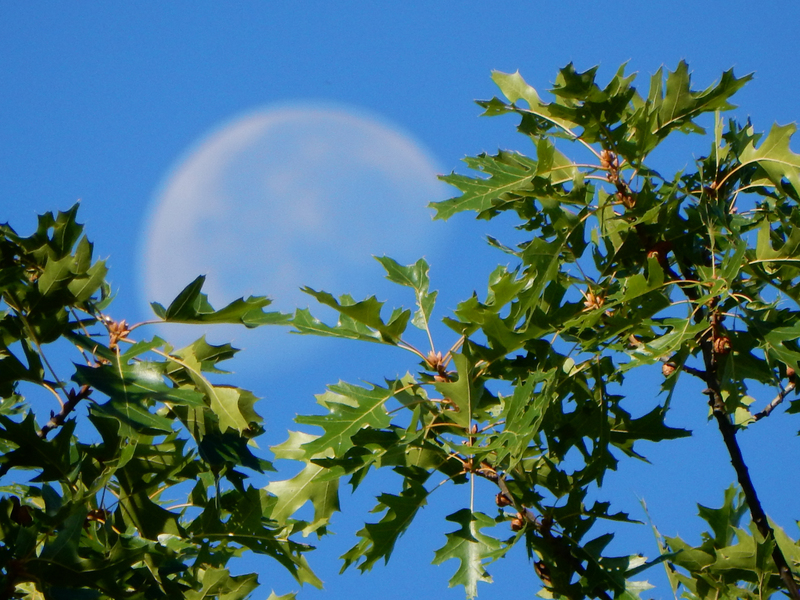 I tend to focus on the moon alone and then move to include the tree. Nice easy post and tough poll. Geez, I had the blurry moon photo all picked out and hit the button when I noticed there was a Maddie choice. No fair, Dan. :-) Hope both you and Maddie have a great Monday. This will be a short week, lots of Maddie-time coming up. I like the moon photos either way, but I like Birds on a Wire best. There are some great shots here despite the absence of Maddie…but always remember photos of most objects and adults can never take the place of animals and small children. Thanks Mary. I sense Maddie nodding in agreement. Sometimes I think she’s trying to tell me not to waste my time trying to get a good picture of a tree, when I could put her floppy-eared mug out here and get a couple of dozen ‘aws’ in a heartbeat. No coincidence when pack leader and dog relax … Something magical is revealed. The choice depends on whether the birds are the focus of the picture or the moon is the focus. That is purely subjective depending on the photographer’s intent. I sense you were very interested in the moon and how to present it best. The moon in focus was what I wanted back in July. Then I wasn’t sure, because I did like the fuzzy-moon photo. After I managed to get what I thought I wanted, I still wasn’t sure. I guess it doesn’t matter. Thanks! Great shots, Dan, especially considering they were done one-handed, with an auto-focus camera, and with your arm being pulled by an impatient dog. However, I did vote for more Maddie shots. No offense! All the photos look great, Dan. While I think I do prefer the idea you were originally going for — in-focus moon, blurry trees — I really do enjoy the composition of that original photo the best. Everything nice and closely cropped. So the “perfect pic” for me would have been the original shot with reversed focus/blur! But all the pics are excellent. The photo of the Starlings with the moon is a great one too. And I agree with your first commenter — both are Starlings! The brown one is either still an adolescent or I think he’s just getting his fall coat a bit earlier than the other one. I believe the sleek black is for summer and breeding time! Thanks for the info on the Starling. My wife suggested that it might also be a starling, but we didn’t think of the color changing. Sheesh, birds are pretty hard to figure out. Ha! Yes, sorry, Dan, I guess that’s exactly what I was saying — which, hearing it said back, makes it sound not so nice. Sorry! ;P And yes, birds can be little tricksters. Both with seasonal colour changes AND the ones where males and females can look totally different! It’s ok Wendy. I just thought it was funny :) I though the other bird might be some sort of thrush. Thrush would certainly have been a legitimate guess. The colouring is right! Great images and Poll! I always enjoy seeing a series of images that worked or didn’t and reading the photographer’s thought process. Auto-focus has a mind of it’s own add to that camera limitations and you may not get the shot you were hoping for. If you’re camera has scene modes that you can get to while letting Maddie sniff around with you being stationary the Mountain mode meaning farthest distance shots -infinity- all should be in focus front to back in that mode. Try it out! Scene modes in Point & Shoots can be used to cheat the cameras not mind…but programming quite often. That get you can make these kinds of images one handed while being pulled by a mid-sized dog is quite amazing! I wouldn’t be able to do it. I can’t even do that with my iPhone! I voted for the in -focus moon with bushes. I loved the branches framing the moon, and the Twilight Moon image. Good work! Thanks Deborah. Maddie has been pretty good lately, and the timing was better in August than July, since the photos were taken on the return trip. Stopping her before we get to the park is asking for trouble/tugging. I never thought to try the mountain mode. I’ll have to give that a try. I also need to get comfortable with the manual settings on this camera. I’m tired of “getting close” and fixing it in software. I’ll save that for when I’m without the pooch, as I almost need two hands to make the adjustments. Thanks also for the comment on the Starlings photo. If you’re camera has Manual Mode that’s my preferred mode of shooting, but the semi-automatic modes A, S, and P give you much more accurate results than Auto everything mode, and using one hand are quicker as you’d do less thinking and adjusting. The camera would do that for you. . In a pinch using the preset Scene modes can get you closer than Auto can. Have fun experimenting with Mountain Mode! I know isn’t Digital wonderful for that! As for the dreaded, “can’t see the screen” dilemma you could rig up something with a loupe like this one. I have the loupe and it’s wonderful! I use it mostly at night. I should add the straps. I haven’t researched any other model or brand, but by now there might be other brands and sizes on the market. I’ll have to check into this. Thanks! Thanks! I need to learn more about this camera. I like what it is capable of doing, but I can’t always let it decide. I was so happy to hear you use a point & shoot because that is what I have also. I find that if I switch settings from ‘close-up’ to ‘landscape’ it will focus on what I want the focus to be on. This is why I don’t get a big-girl camera. Too many settings and too little patience to learn. Good luck, Dan. Nice little play on words there, Dan. She thanks you. She’s such a ham. I voted twice. Maddie and the birds in focus. I have the same problem of dog, on a leash. I take maybe ten photo’s of the same thing before I get one that hasn’t been jerked. I’m glad you understand, John. This was great, Dan. Be sure to tell Maddie she was the winner! Sorry Janet. I think you can click on them all, but I was trying to narrow it down. Clearly, the world wants more Maddie – what can I say? Great photos Dan. It is difficult to choose when using a zoom with no manual settings. I shoot mostly in zoom so often have this problem. Some cameras are able to focus in on two set points byt first setting one, holding the button and moving to focus the other. I don’t think mine does that. I usually shoot both objects in focus in different sets. Thanks Cheryl. Mine does that but focusing on the moon and then moving the camera makes it hard to keep the moon in the frame :) We try these things. Sometimes it works, but it’s fun to try. Glad you let me choose two. This is just a great example of how different things are depending on the focus you give to them and neither perspective if right or wrong. Thanks! Yeah, I don’t think you can go with right/wrong when it comes to photography. Usually, if I get some portion that is clear, I put it in the win column. I like them all. Each photo tells a different story. The blurry moon with tree in focus has a mysterious air. I do like them all. Thanks Debra. Thanks Amy. I appreciate the comment. I guess it really isn’t an either/or kind of thing. I do like all of these (I have many that didn’t make the cut), and I will give you guys more Maddie. Between her and Oreo, I didn’t have a chance this past week. Not that we don’t appreciate your shots, Dan, but animals just seem to steal the show. Here I am working so darn hard at improving my technique with landscape and macro and some are asking for pics of my cats. Can we ever win? And oh the thought of you taking pics while being dragged by Maddie is hysterical. Your dexterity is amazing!!! GRIN! I voted on Monday and getting a late time comment in on Tuesday, Dan. I like that the white moon shows up in your sky photos so well! I liked the birds which were in focus best, with still a nice white moon in a pretty blue green sky in the background. I liked the tree branch’s clarity, too. The extra Maddie photographs are always fun, but I voted for the first one I described. Thanks Robin. I like seeing the moon in the morning. It’s always a nice surprise. You do a really good job with pictures. You and Cheryl are equally good at pictures and I admire and learn from you guys on how to take great shots. Lately I and Sarah have taken lot of pictures, but I’m working on a new blog series, so I thought let me preserve it for the posts. Thank you. I look forward to the new series. I always admire your photos!